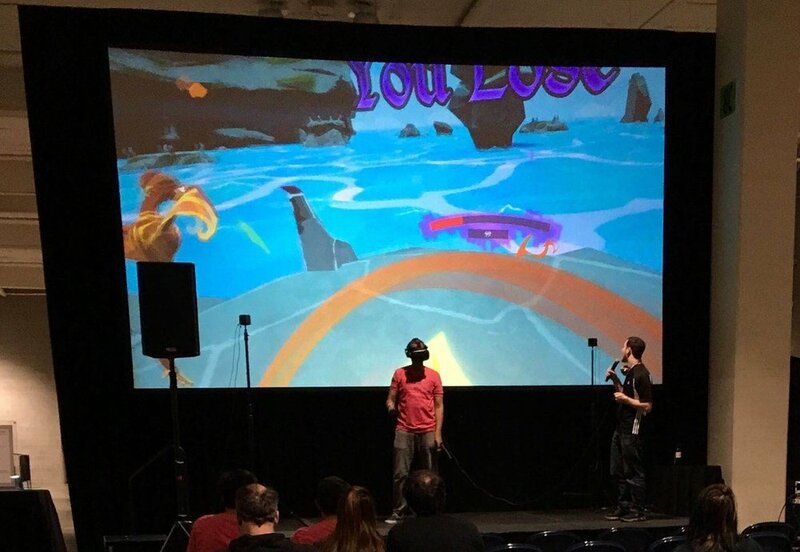 We were excited to show off our wizard dueling VR game, inVokeR, at the Biz-Tech Summit last Saturday (Oct 28th). Attendees got the chance to play our game on the HTC Vive and one of the new Windows Mixed Reality headsets (featured in the photo above). Look for our Patch 0.2.0 release next month featuring new levels and epic boss battles! Thanks to the Seattle Biz-Tech Summit organizers and everyone who stopped by to play! We at 8th Shore have partnered with Microsoft! InVokeR will be available for Microsoft's Mixed Reality headsets at their launch! We are very excited to be working with Microsoft to help support the the Bright Future of VR/MR! We hope to see you all there! inVokeR: Now compatible with Windows Mixed Reality! We are happy to announce that we have successfully ported inVokeR to Microsoft's Mixed reality headset! Many thanks to Microsoft's VR team and our talented developers for making this possible! Next friday, August 18th from 3pm - 5pm PST we'll be hosting a dev fight night where the dev team will be online searching for public matches! We've been super happy to see how much everyone is enjoying inVokeR and we've recieved a lot of great feedback so far! We're always looking for more feedback, so please check out the feedback FAQ and help us make inVokeR the best game we can! Today we're releasing a minor patch, including some UI and tutorial clarity improvements, as well as bug fixes and one important new feature: Player-controlled spell calibration! We've heard your feedback on some spells having trouble being recognized, and this feature will (hopefully!) fix the issue. You can find the new spell calibration button if you go to Settings on the main menu. With this new feature, by casting each spell 50 times, the gestures become calibrated to your particular way of casting the spell, which will significantly increase your spell detection success rate. Because of this, we very strongly recommend that everyone go through spell calibration! Replaced player UI with an improved UI with additional indication of player health. Improved wording of first-time tutorial message and added additional message at the end of the "basics" tutorial to draw attention to the fact that there are more tutorials. Added some additional effects on minor actions such as high-fiving a guest. Rarely, in an online match the client's projectile would not return to their hand. When clearing the Boss Trial tutorial, the "Shapes are Hard" achievement was incorrectly obtained. The "Cool Story, Bro" achievement was not unlocking correctly. For those who have already gone through all the tutorials, completing any tutorial will unlock the achievement. In an online match if the client was Ice Mage and activated their special, the special's hand glowing effect would not wear off, causing the player to be unable to cast spells for the remainder of the match. inVokeR VR was play-testing at Seattle popular Esports center Virtual Sports on June 2, 2017! 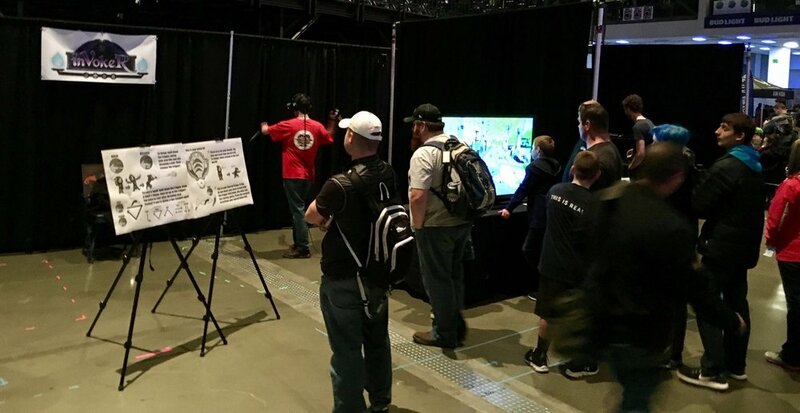 Our most current VR game inVokeR was showcasing at 10th Annual Power of Play, April 26, 2017 at Meydenbauer Center in Bellevue! One of our publishers made us a gift for adding depth to one of our VR projects!